This is an incomplete compilation of known hardware and systems that were developed by Norsk Data AS. The list contains both systems, boards and single items mentioned in documentation and other places. Links to online resources, references and to where hardware is located will also be included. 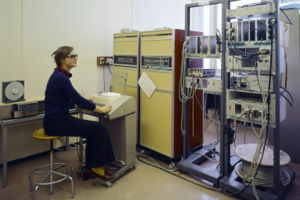 Testing electronics at CERN with a NORD-10. For more see the list of 2 digit, 3 digit and 4 digit product codes. For more, see the List of 6 digit product codes. There is a lot of different boards used in the NORD-1 computer. Most are numbered with a three digit code starting at 101 and at least going up to 504. The NORD-1 was one of the first computers to be constructed of integrated circuits instead of transistors. Almost all of the boards are built with the 74-series IC:s.
When the NORD-10 was designed the quality and professionalism shows off, solder mask, silk screen and a more compact design. The boards now have a print number and a product number. The known print numbers goes from 1001 to 1932 while the product numbers are in the range of 322000 to 322437. The NORD-50 CPU is made up of three crates with a total of 82 cards. Many of the cards are the same so there are only 26 different cards. The cards are numbered from 1500 to 1532. This is a list of boards used in the ND-100 series computers based on the print number on the circuit board. This is a list of boards used in the ND-500/5000 series computers based on the print number on the circuit board. This is a list of boards used in the ND-5000 series computers based on the print number on the circuit board. ↑ Picture of the production hall at Skullerud. This page was last modified on 16 April 2019, at 13:27.